The car insurance declarations page explains how much your car insurance costs and how much you’re getting for what you pay. A car insurance declarations page explains how much your car insurance costs and how much you’re getting for what you pay. It has the amount of car insurance coverage you purchased in each component (liability, personal injury, collision and comprehensive, and uninsured/underinsured motorist coverage), any optional coverage, and any discounts you get. The declarations page (also called the dec page) contains your premium, how frequently you pay it, and the deductibles you’re required to pay for each coverage component. It will also list your car, its make, model, and vehicle identification number, and its lienholder, if you lease. You can usually find the declarations page attached to the front of your car insurance policy. If you don’t have your declarations page, call your car insurance company to request a copy. You may also be able to access it online through your carrier's website or app. When you make a change to your coverage, your carrier should send you a new declarations page. 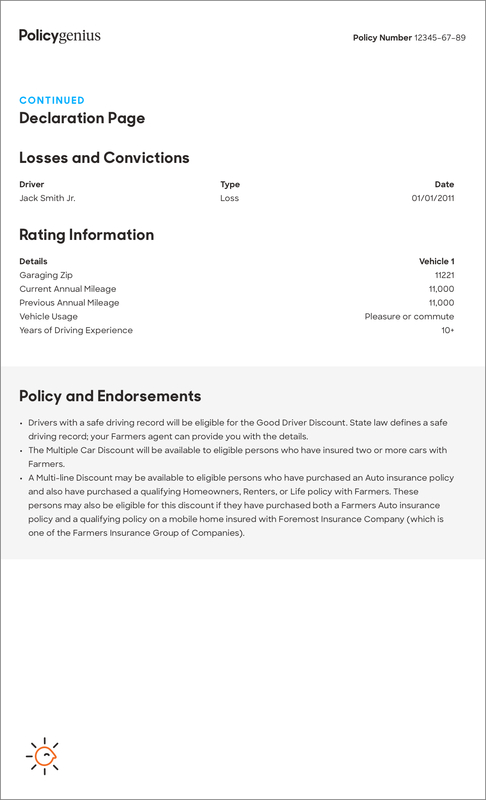 At the top of the page, the auto insurance declarations page will list the policy number, which will need to be referenced when filing a claim. Some dec sheets will also list your previous policy number; since you may have to get a new policy every six months to a year, this could change often. It will also list the policy period, a span of months beginning from one date, the effective date, and ending on the other, the expiration date. These dates will each be written as a precise day, month, and year. Some policies even include a start time, usually one minute after midnight on the start date of the policy. The named insured. Usually, that’s you, the person buying the policy to insure your car. It may also be anyone else who drives the car, such as your children or spouse. The names, ages, and corresponding addresses of each person who’s covered by the policy will be listed. Sometimes, the dec sheet may also list which drivers are excluded from operating the vehicle. The agent. The representative from your car insurance company, if applicable, and his or her phone number. The carrier. Your car insurance company. The policy dec page should include their address and a number to reach them. The lienholder. The entity who holds your lease, if you lease the car or purchased it with a car loan. This will likely be a bank or credit company, and the dec sheet may contain their address. The premium is the amount you have to pay during the policy period to keep your car insurance coverage in force. Your premium is determined by a number of factors, from personal characteristics (age, gender, location) to driving history (whether you’ve gotten a DWI/DUI or accrued other traffic violations) to type of car you drive and how often you drive it. The most important factor in determining your car insurance premium is how much you’ll need in coverage. More coverage means a higher premium. For more on how your premium is determined, check out our guide. The deductible is the amount you have to pay out of pocket when filing an auto insurance claim before the insurance company pays the rest. A deductible will be listed next to the relevant car insurance coverage types (see below), but not every component of car insurance coverage requires you to meet a deductible. In fact, liability coverage never has a deductible, and for the other components of car insurance coverage you can usually choose the deductible you’re willing to pay. Offering to pay a higher deductible – taking some of the load off the carrier when you file a claim – means you’ll get to pay a lower premium. Typical deductibles are between $100, $500, and $1,000. The coverages are what you’re purchasing when you buy a car insurance policy. Every state except two requires you to buy car insurance, and of those 48 states only Florida doesn’t require liability coverage. Some of the other components of car insurance coverage may be optional in your state. In addition to listing each type of coverage you purchase, the dec sheet will list how much you purchased of that coverage. This is called the limits of liability, meaning the car insurance company’s liability to you. If you have $100,000 in coverage for one type of coverage, that’s the maximum amount – the limit – that the car insurance company is obligated to pay. 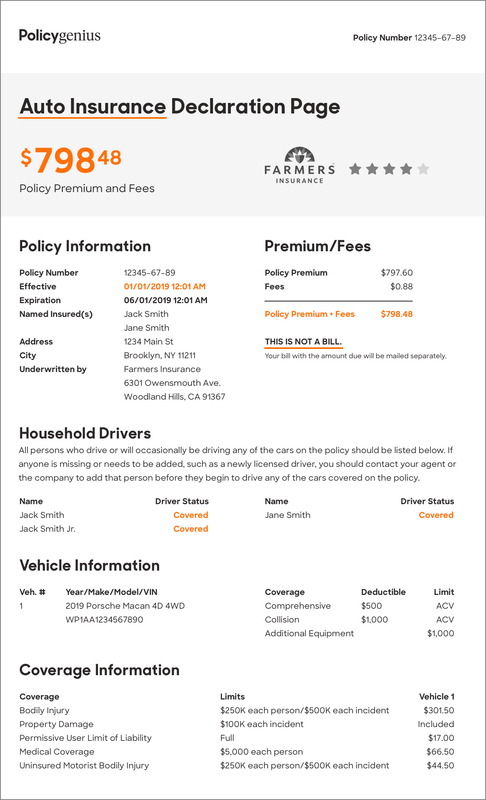 Your declaration sheet will describe your policy limits in terms of per person limits and per accident limits, sometimes both for the same coverage type. (For example, $100,000 per person and $300,00 per accident.) Once the carrier has paid out to its limit of liability, you’ll have to pay for any remaining expenses out of pocket. If you have multiple cars, they will be itemized with each coverage amount stated per vehicle. It’s possible to buy less coverage for one insured car and more for another. You might consider buying less coverage for a car if it’s older and doesn’t cost as much to replace, but you should always make sure you have the coverage you need. Liability insurance. Coverage for bodily injury or property damage you cause while driving to another driver. Personal injury protection (PIP). Coverage for medical expenses incurred due to injuries you cause to yourself or your passengers. Collision coverage. Coverage for repair bills you incur when your car is involved in a collision with another car. Comprehensive coverage. Coverage for repair bills you incur when your car is damaged or destroyed in a non-car-related situation, such as weather or rioting, or if it’s stolen. Underinsured/uninsured motorist coverage. Coverage for when the other driver is liable for your medical or repair bills but doesn’t have car insurance or doesn’t have enough of it. Gap insurance. Coverage for when your car is stolen or completely destroyed but typical comprehensive reimbursement is less than you still owe on the car’s lease or loan. Everyone has different coverage needs, and Policygenius makes it easy to find a car insurance policy that satisfies all your coverage needs while still being affordable. You can purchase coverage in some optional components of car insurance. These may increase your premium slightly. 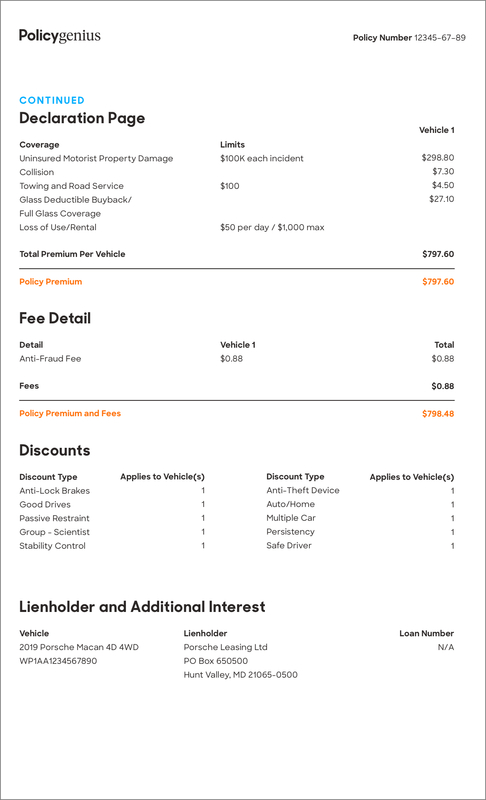 Depending on the auto insurance company, some of the car insurance types listed above will be considered optional and listed as such on your policy declarations sheet. Note that if you lease a car, the lienholder may require you to purchase collision and comprehensive insurance. Other types of optional coverages follow. If you don’t see any of these listed on your declarations page but are interested in adding them to your policy, talk to your car insurance company. Endorsements, or riders, are optional, additional policy terms attached to your base auto insurance policy that enhance some of the coverage contained therein. Depending on the rider, it may cost extra to add one to your policy. Sometimes endorsements are not included on your declarations sheet. For information about how much you’re paying for each endorsement and how it affects your coverage, you’ll have to find the terms of the rider in your policy. Sometimes they’re at the very end of the policy, but other times they’re baked into the policy’s terms throughout. Every auto carrier offers car insurance discounts. These discounts will be listed on your policy declarations sheet, sometimes (but not always) with the amount by which they reduce your premiums. Bundling discount. If you buy your car insurance and your homeowners or renters insurance from the same company, you’ll typically get a discount for bundling your coverage together. Multiple vehicle discount. Insuring multiple cars under the same policy will yield a discount. Safe driving discount. For people who have demonstrated safe driving over a span of a certain number of years. This mean no accidents, no DWI/DUIs, and no moving violations. Taking a driver’s education course may also qualify. Premium paid in full. You can get a discount if you pay your premiums all at once instead of monthly. Security features discount. Installing security features like a car alarm and anti-lock brakes could result in a discount. Loyalty discount. When your policy is up for renewal after your policy period ends, you may get a discount for being a customer for a certain number of years. Organization membership discounts. Belonging to some participating organizations could result in a discount. This could mean being a student at or alumni of a university or belonging to a fraternity or sorority. Your employer may also offer car insurance discounts. When you renew your car insurance policy, you’ll be issued a new declarations sheet. All the information will be updated to reflect the changes to your policy: new premium and policy period, new discounts (if you’ve been driving safer, for example), new or increased coverage, any new insured cars or drivers, and any new endorsements, and so on. If your premium has changed, sometimes the declaration sheet will indicate it with the percentage or dollar amount by which it has changed in addition to listing the new premium. Car insurance policy periods typically last either six months or one year. If you’re looking to get a better rate, you can work with Policygenius to easily compare quotes from different insurers online. Have your declarations sheet handy to quickly compare your coverage.